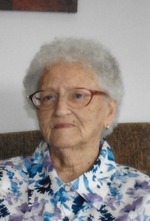 Kathryn L. Bowman, age 90, of Joplin, Mo., passed away on Monday March 26, 2018, at National Healthcare, following an illness. Kathryn was born on October 17, 1927 in Wheaton, Mo., the daughter of the late Beamis and Emma Catherine (Stephens) Sanders. She has been a lifetime area resident. She graduated from Fairview High School in 1945. She worked twenty-eight years in quality control at Eagle Picher, retiring in 1991. She was a member of Forest Park Baptist Church. She enjoyed reading. Kathryn married Kenneth Jones on September 23, 1945, he preceded her in death. She married Curtis Bowman on November 23, 1963 in Miami, Okla. He preceded her in death on January 24, 1971. She was also preceded in death by four brothers and one sister. She is survived by three daughters, Jean Jones, Joplin, Kathy Wade, Joplin and Kim Grizzle and husband Jeff, Carl Junction, Mo. ; one sister, Fon Harter, Joplin; two grandchildren, Cory Vance, Joplin, and Cameron Rogers, Webb City, Mo. ; and five great-grandchildren. Graveside services will be 2:00 p.m. Thursday at Ozark memorial Park Cemetery. Reverend John Swadley will officiate. There is no formal visitation. Memorial contributions may be given to the Joplin Humane Society in care of the mortuary. Arrangements are under the direction of Mason-Woodard Mortuary & Crematory. Next PostNext Carl Smith, Jr.